America’s first modern police forces – publicly-supported bureaucracies with officers who were employees rather than community volunteers – emerged in large cities in the decades preceding the Civil War. The leading families of Boston, New York, Chicago, Baltimore and St. Louis, among other cities, established formal departments in response to increasing urbanization, immigration and social disorder. They were also driven by pecuniary concerns; formal police departments allowed elites to transfer the cost of protecting their private wealth to the state. “Early American police departments,” writes Potter, “shared two primary characteristics: they were notoriously corrupt and flagrantly brutal.” Under the control of local machines and party bosses, their ranks were often padded with unqualified political operatives who engaged in the vice they were charged with preventing. From the beginning, excessive force was used against striking workers and the “dangerous classes” – the poor, free blacks, and foreign immigrants. Slave patrols had three primary functions: (1) to chase down, apprehend, and return to their owners, runaway slaves; (2) to provide a form of organized terror to deter slave revolts; and, (3) to maintain a form of discipline for slave-workers who were subject to summary justice, outside of the law, if they violated any plantation rules. That Missouri, a border state, is the site of the latest provocation is no coincidence. 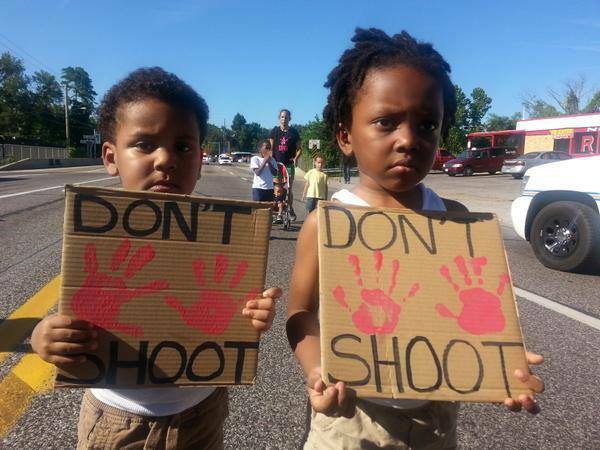 The twin undercurrents of urban policing and control of black bodies, long mingling in our cultural and institutional memories, continue to destroy black lives – every 28 hours in 2012, according to one study. The conscience of a nation is riveted by Ferguson. Michael Brown was shot six times by Darren Wilson, a police officer with the Ferguson Police Department. His body was left in the street for four hours, then loaded into an SUV in a blue tarp and transported to a nearby morgue. Wilson was not identified by authorities until a week after the incident; he has since gone into hiding, and as of now is charged with no crime. Authorities in Los Angeles have still not identified the officers involved in the shooting of Ezell Ford, a black Los Angeles resident with a history of mental illness. There is hope that this time, with the media demanding answers alongside the family of the slain; with blame squarely laid at the feet of the authorities, despite their efforts to smear victims; with harrowing images of military hardware deployed against civilians on an American street; this time will be different. But the numbers tell another story. According to a Pew survey, only 37 percent of white Americans say Michael Brown’s murder raises important racial issues; 47 percent of white Americans thought race “is getting more attention that it deserved.” Perhaps our country is so intent on ignoring its history that we will fail to see it written in front of us. I’ve written before about the pernicious effects of suburbanization. the dark legacy of how we police our communities is deeply tied to how we have constructed those communities. And we have constructed communities so starkly different that one cannot grasp the reality of the other side. A 2013 survey found that “overall, the social networks of whites are a remarkable 91 percent white.” A full three-quarters of white people have entirely white social networks; the same is true for 65 percent of black Americans and 46 percent of Hispanic Americans. Most of this is bound up in the history of racist housing policy. A hundred years later, we’re still keeping “the dangerous classes” at bay. Fifty years later, we’re still confronting protesters with overwhelming force. And, like clockwork, the bodies continue to fall.